This episode teaches you the basics of applying materials to your objects in Blender. As always, I hope you enjoy the material on my website, and I hope to see you get involved with the material here. Thank you for visiting Shembol.com. I look forward to hearing from you. Greetings once again, Blenderheads! 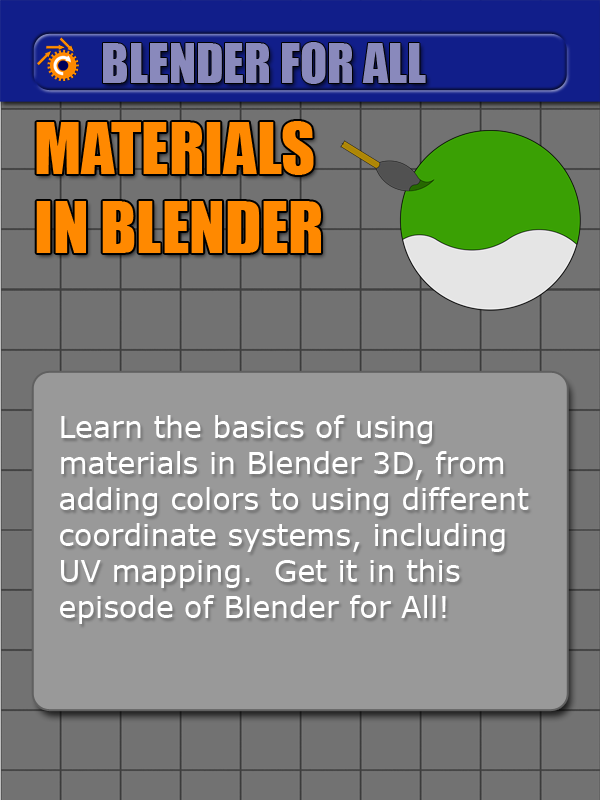 This episode of 'Blender for All' is all about materials. When doing materials, many of us get into the mentality of putting color onto an object and maybe doing a pattern. Materials, however, can do a lot for objects and scenery. When doing a scene using materials, the type of materials used will set the tone for the entire rendered still or animation. Examples include doing photorealistic, toon style, or maybe you do a scene where everything turns out metallic. Hi everyone! Nathan here again. I've been making the attempt to keep things focused and to try to post regularly about the going on at Shembol Studio. 'Blender for All' has a lot of episodes lined up, so I'm not too worried about it, but 'Animation for All' needs a lot of improvement. One thing I look at is what kind material aspiring animators look for. Next, I look for what I know now. Other things I've thought of have been artistic styles to bring in to an animation. I've been working with Blender 3D for years now, and it's been great. However, I've also found other platforms and resources to use to make my animations. I have a lot of ideas for 'Animation for All', none of which is currently organized. So I would like to hear from you, my community, of things you would want to see for animation tutorials. Let me know what would be some topics of discussion you'd like to have in the series in the comments section below. Thank you! Hello everyone! Welcome back to Shembol.com. Today I wanted to give you all a glimpse of what's to come this week. As ideas come along, there will be more Punicus cartoons and memes to be had. 'Animation for All' hasn't been started yet as far as the YouTube channel is concerned. With that channel, I'll admit that it's been hard coming up with content for that channel, and it's a place where I would like to ask you, my audience, what you would like to see on 'Animation for All'. So far, ideas for an introduction and a bouncing ball tutorial have been put into the works. The idea of 'Animation for All' is to be a series that covers all of animation as much as possible, and not to be platform or software specific. If you have any ideas you'd like to see on Animation for All', I'd love to hear them. You can leave comments below, or you can go to our feedback/contact page as well and leave comments there. For 'Blender for All', I have an episode coming this weekend that details using materials in Blender, and I hope that you'll check that out this weekend. More episodes of 'Blender for All' will keep coming as I'm able to keep up. A lot of episodes are in line for 'Blender for All', so stay tuned for that. Here's to an awesome week, everyone! Greetings, Blenderheads out there! In this 'Blender for All' tutorial, I'll be talking about something that may not just be for Blender alone, but a general best practice for doing projects. I am referring to organizing a project in Blender. Hi everyone! Today, the law firm of Punicus, Punicus, Punicus and Crook has a new member: Fendricks Dylmerkempland, the newest paralegal (which brings the total of paralegals in the firm to one). He will be helping Mr. Punicus III in attempting to win some ridiculous lawsuits. Job duties will include gathering information on cases run by Mr. Punicus, archiving and disposing of old case files (we can't leave those skeletons hanging about in the closet for someone else to discover now, can we? ), and in all cases, prepare Mr. Punicus so that he's the guy that looks good. So let's give Fendricks a warm welcome as he now begins his new job at the law firm of Punicus, Punicus, Punicus and Crook! Hi everyone! I hope you all had a great weekend. For now, understandably, it's MONDAY!!!!!! Monday definitely gets a bad rap. A lot of us have had an enjoyable weekend, and because it was an enjoyable weekend, it comes to an abrupt screeching halt by bad guy Monday. Doesn't sound like a fun day at all, does it? I mean, after all, if you work at a typical office job doing the 9 to 5 shift Monday through Friday, it's likely that you'll be planning out the week for your job. You may also have some catching up to do from the previous week. Now, while enduring a Monday is not the most appealing of things to do normally, Monday can be looked at differently as well. Monday can also be a day of renewal. It can be a new opportunity to prove to ourselves and to those around us what we can achieve in the coming week. Monday can be a day to try to get ahead so that tasks that must be completed can be done early, and other tasks that aren't as important can be started later in the week. Now the question comes: what is going on here at shembol.com? A new episode of 'Blender for All' is coming. This episode will be about project organization in Blender, so I hope that you will check that out this weekend, I hope that you will learn something new, and that you will leave feedback about the episode. What are some goals that you have for this week? Are there any questions on your mind as you try to accomplish these goals? I welcome comments in the comments section and hope to hear from you, and may you have a fulfilling and prosperous work week. Happy Friday everyone! Today is the day of the week that even makes Punicus smile. The weekend is coming, staying up late and playing is nice. There's something about Friday that's just fun. For Punicus, he likes the weekend because it gives him time away from the busy life so he can think. Then he can plot. And plan. And prepare. Then he can go back to work knowing that he's making someone's life safer and killing someone else's fun. Everyone has their idea of fun on the weekend. I'm hoping to get another episode of 'Blender For All' out next week to share with everyone. There will be a lot to do. What are some of your typical weekends? Leave comments below, and again, Happy Friday! Hi all! Nathan here again. It's been a long time since I've been on the website. I'm still developing content, but my time and energy have been very limited as of late. I'd just like to let everyone know that I'm still around and involved in a lot of activities. I am developing more episodes for 'Blender for All'. I looked at my timeline and realized that I haven't released an episode in roughly a year. That is not cool! So, I'm getting myself back into it. I have an episode lined up. 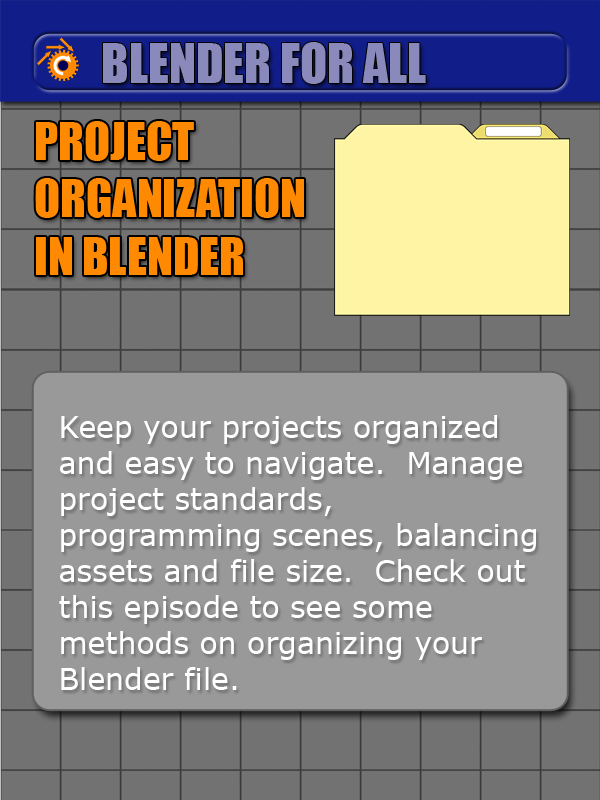 My next episode will be about organizing a project in Blender. Look forward to seeing that episode later this month. I'm looking forward to doing some cartoon shorts as well. There will be a lot to do coming up, so stay tuned! Copyright 2018 Shembol Studio. Simple theme. Powered by Blogger.